This article is about the second-longest river in South America. For the shorter river in Goiás, central Brazil, see Paranã River. The Paraná River (Spanish: Río Paraná [ˈri.o paɾaˈna], Portuguese: Rio Paraná, Guarani: Ysyry Parana) is a river in south Central South America, running through Brazil, Paraguay, and Argentina for some 4,880 kilometres (3,030 mi). It is second in length only to the Amazon River among South American rivers. The name Paraná is an abbreviation of the phrase "para rehe onáva", which comes from the Tupi language and means "like the sea" (that is, "as big as the sea"). It merges first with the Paraguay River and then farther downstream with the Uruguay River to form the Río de la Plata and empties into the Atlantic Ocean. The first European to go up the Paraná River was the Venetian explorer Sebastian Cabot, in 1526, while working for Spain. The course is formed at the confluence of the Paranaiba and Rio Grande rivers in southern Brazil. From the confluence the river flows in a generally southwestern direction for about 619 km (385 mi) before encountering the city of Saltos del Guaira, Paraguay. This was once the location of the Guaíra Falls (Sete Quedas waterfalls, where the Paraná fell over a series of seven cascades. This natural feature was said to rival the world-famous Iguazu Falls to the south. The falls were flooded, however, by the construction of the Itaipu Dam, which began operating in 1984. For approximately the next 200 km (120 mi) the Paraná flows southward and forms a natural boundary between Paraguay and Brazil until the confluence with the Iguazu River. Shortly upstream from this confluence, however, the river is dammed by the Itaipu Dam, the second largest hydroelectric power plant in the world (following the Three Gorges Dam in the People's Republic of China), and creating a massive, shallow reservoir behind it. After merging with the Iguazu, the Paraná then becomes the natural border between Paraguay and Argentina. Overlooking the Paraná River from Encarnación, Paraguay, across the river, is downtown Posadas, Argentina. The river continues its general southward course for about 468 km (291 mi) before making a gradual turn to the west for another 820 km (510 mi), and then encounters the Paraguay River, the largest tributary along the course of the river. Before this confluence the river passes through a second major hydroelectric project, the Yaciretá Dam, a joint project between Paraguay and Argentina. The massive reservoir formed by the project has been the source of a number of problems for people living along the river, most notably the poorer merchants and residents in the low-lying areas of Encarnación, a major city on the southern border of Paraguay. River levels rose dramatically upon completion of the dam, flooding out large sections of the city's lower areas. From the confluence with the Paraguay River, the Paraná again turns to the south for another approximately 820 km (510 mi) through Argentina, making a slow turn back to the east near the city of Rosario for the final stretch of less than 500 km (310 mi) before merging with the Uruguay River to form the Río de la Plata. This flows into the Atlantic Ocean. During the part of its course downstream from the city of Diamante, Entre Ríos, it splits into several arms and it forms the Paraná Delta. 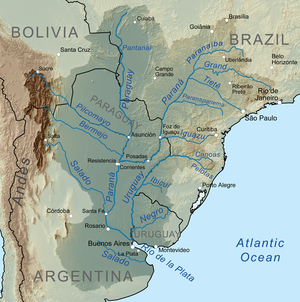 Together with its tributaries, the Rio Paraná forms a massive drainage basin that encompasses much of the southcentral part of South America, essentially including all of Paraguay, much of southern Brazil, northern Argentina, and the southeastern part of Bolivia. If the Uruguay River is counted as a tributary to the Paraná, this watershed extends to cover most of Uruguay as well. The volume of water flowing into the Atlantic Ocean through the Río de la Plata roughly equals the volume at the Mississippi River delta. This watershed contains a number of large cities, including São Paulo, Buenos Aires, Rosario, Asunción, Brasília, and La Plata. The Paraná and its tributaries provide a source of income and of daily sustenance for fishermen who live along its banks. Some of the species of fish (such as the surubí and the sábalo) are commercially important, and they are exploited for heavy internal consumption or for export. The Parana River delta ranks as one of the world's greatest bird-watching destinations. Much of the length of the Paraná is navigable, and the river serves as an important waterway linking inland cities in Argentina and Paraguay with the ocean, providing deepwater ports in some of these cities. The construction of enormous hydroelectric dams along the river's length has blocked its use as a shipping corridor to cities further upstream, but the economic impact of those dams offsets this. The Yacyretá Dam and the Itaipu Dam on the Paraguay border have made the small, largely undeveloped nation of Paraguay the world's largest exporter of hydroelectric power. Due to its use for oceangoing ships, measurements of the water tables extend back to 1904. The data correlates with the solar cycle. Paraná River source at the border of the states of São Paulo, Mato Grosso do Sul and Minas Gerais, in Brazil. ^ "Monitoramento da Qualidade das Águas Superficiais da Bacia do Río Paranaíba: Relatório Annual 2007". Governo do Estado de Minas Gerais, Instituto Mineiro de Gestão das Águas. 2008. Archived from the original (PDF in ZIP) on 6 July 2011. Retrieved 12 August 2010. ^ Iriondo, Martín H., Juan César Paggi, and María Julieta Parma, eds. The Middle Paraná River: limnology of a subtropical wetland. Chapter "Birds." Springer Science & Business Media, 2007. ^ Pablo J.D. Mauas & Andrea P. Buccino. "Long-term solar activity influences on South American rivers" page 5. Journal of Atmospheric and Solar-Terrestrial Physics on Space Climate, March 2010. Accessed: 20 September 2014. Wikimedia Commons has media related to Paraná River. "Paraná" . New International Encyclopedia. 1905. This page was last edited on 11 April 2019, at 15:06 (UTC).